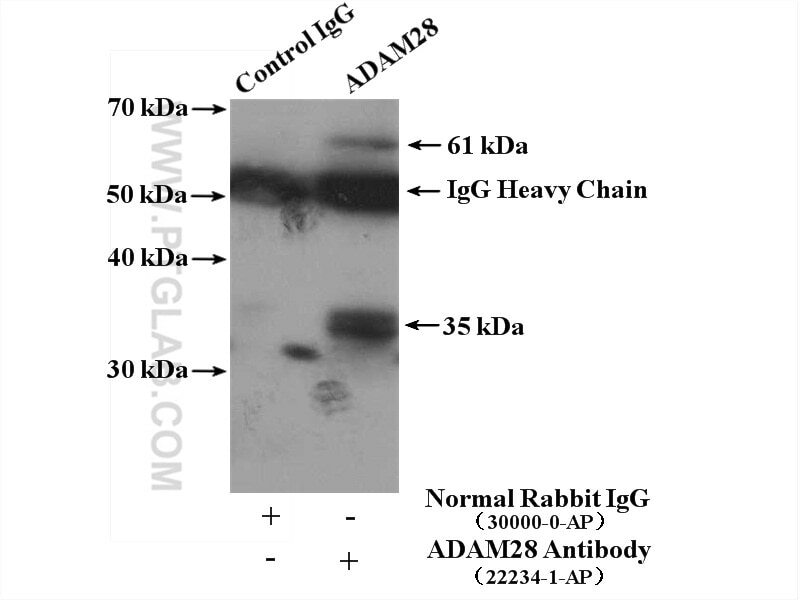 IP Result of anti-ADAM28 (IP:22234-1-AP, 4ug; Detection:22234-1-AP 1:800) with mouse lung tissue lysate 3600ug. ADAM28 belongs to a family of cell surface and secreted glycoproteins that possess both proteolytic and adhesive properties. ADAM28 is predominantly expressed by carcinoma cells in the breast carcinoma tissues as protein bands of 42 kDa and 55/57 kDa, which correspond to the active forms of ADAM28s and ADAM28m, respectively.In human non-small cell lung carcinomas and breast carcinomas, ADAM28 is overexpressed predominantly by carcinoma cells, and the expression correlates with carcinoma cell proliferation and lymph node metastasis(PMID:19601836). ADAM28 promotes tumor growth and dissemination of acute myeloid leukemia through IGFBP-3 degradation and IGF-I-induced cell proliferation.